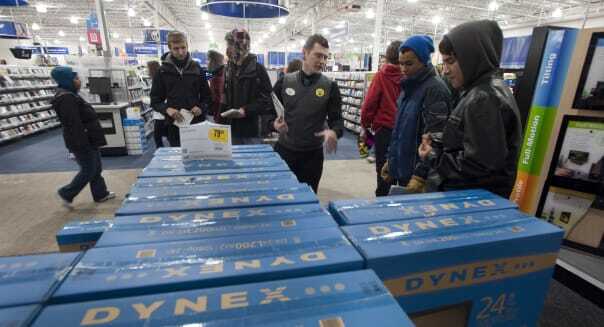 If you were thinking about buying your new TV on Black Friday, you may want to think again. Although discounted TVs are a Black Friday tradition, many shoppers looking for their new set the day after Thanksgiving could come away disappointed. That isn't to say you can't get a cheap big-screen on Black Friday -- the deals are certainly out there. The problem is the value. A combination of subterfuge and flashy sticker prices could lead shoppers into a purchase they may later regret. Unfortunately, most of the TVs on sale during Black Friday are poor in quality -- no-name brands with horrendous displays. HDTVs are not all alike -- there's more to a television than screen size and resolution. Picture quality can vary significantly from one set to another, with higher-quality televisions offering superior images, deeper black levels, and more accurate colors. Televisions with high input lag can make fast-paced video games nearly unplayable, while low refresh rates on LED sets may produce a blurry image during fast-paced action scenes, often when watching sports. In the same way two midsize sedans may vary drastically in quality (say, a BMW 3 Series and a Chevy Malibu), two different 50-inch HDTVs can look quite different. Consumer Reports gives only four television manufacturers its coveted "A" rating: LG (LGEAF), Panasonic (PCRFY), Samsung (SSNLF) and Sony (SNE). Vizio and Sharp (SHCAY) are still respectable, earning a "B." Insignia, Toshiba, JVC, Philips (PHG), Magnavox and Sanyo get a passing grade, but just barely ("C+"). Most TVs discounted on Black Friday fall into the latter group, assuming they even make the grade at all. Target (TGT), for example, is offering a 40-inch LED for just $119 on Black Friday. While that deal appears almost unbelievable at first glance, the set on sale is an Element, a brand that Consumer Reports doesn't even consider. Similarly, Walmart (WMT) is promising to sell shoppers a $98 32-inch HDTV -- but doesn't even bother to list the brand in its ad. Black Friday ads from other retailers, including Best Buy (BBY), Kmart and Sears (SHLD) are littered with discount Insignias, RCAs and Seikis. Although these televisions may be tolerable for the least-discerning shoppers, those seeking a higher-quality set may want to look elsewhere. However, to be fair, there are some big-name TVs on sale. Best Buy, most notably, has a discounted Panasonic on the front page of its ad. Panasonic's sets are highly regarded -- the Panasonic ZT60 is still considered one of the finest televisions ever made -- but unfortunately, just picking a good brand doesn't guarantee a quality product. The particular model that Best Buy is offering -- the 50A400 -- scored a modest 6 out 10 on AVForums: "We have seen a number of excellent TVs from Panasonic this year but sadly [this] is not one of them. In fact, it's one of the worst TVs we have reviewed so far, failing on almost every level to deliver the kind of performance ... we would expect from even a budget TV." %VIRTUAL-pullquote-A more significant -- and more insidious -- problem is the derivative model.%A more significant -- and more insidious -- problem is the derivative model: In their quest to offer ever greater deals with which to entice shoppers, retailers contract with television manufacturers for special Black Friday sets. Like a piece of clothing purchased from an outlet store, these televisions are based on full-featured TVs, but are commonly missing key features, often made with lesser-quality parts or sold with sharply reduced warranties. Derivative models are manufactured in limited runs for the express purpose of being offered "on sale" during Black Friday. Unfortunately, it's difficult to determine which sets are derivatives -- the retailers don't make it easy, and even if you identify one, it's often hard to find its shortcomings. This year, one of Best Buy's doorbusters appears to be a derivative model -- the 55-inch 4K Samsung television. That particular model (UN55HU6830) is not available from any other retailer, and Best Buy has only had it on sale this month -- an almost sure sign of a derivative. It's hard to say with absolute certainty, but it appears to be based on Samsung's UN55HU6840. Both TVs are highly similar, but the Black Friday version has a much lower refresh rate (60 Hz vs 120 Hz). TVs with higher refresh rates are better at handling fast-moving video. Given that Best Buy is only selling the 6830 for $100 less ($899) than the 6840 ($999), buyers looking for a 4K Samsung may wish to skip the lines and spend the $100 for the superior 6840. Black Friday isn't the only day TVs are on sale: With new models debuting in the spring, retailers are often looking to dump older sets in March, while big screens in particular are often commonly discounted ahead of the Super Bowl. With the long lines and low-quality sets Black Friday brings, consumers may be better off shopping for a new TV at those times of year instead. Neither Motley Fool contributor Sam Mattera nor The Motley Fool has a position in any of the stocks mentioned. Try any of our Foolish newsletter services free for 30 days. Want to invest in the latest gadget? Check outour free report on the Apple Watchto learn where the real money is to be made for early investors.